Susan Curry is known throughout the Philadelphia region as an environmental organizer, perhaps most notably as one of the founders of Pennypack Farm, the first organic CSA-centric farm in Montgomery County. "Voluntarily living with very little income by significantly reducing expenses”—through the Northwest Earth Institute, a Portland, Ore., nonprofit that mentors those concerned with environmental issues. 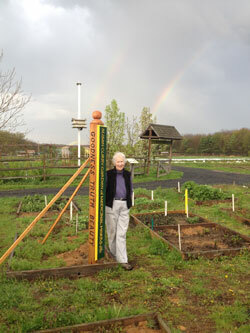 When the local group decided to start an organic farm, Curry wrote a letter to the editor of the Ambler Gazette, calling for a meeting at the Trax Café. The group became the founding committee of Pennypack Farm. “Every time we met at Trax Café, I had everyone write what they wanted our values to be," Curry says. “I always wrote ‘bringing like-minded, progressive people together to form a community.'" That phrase could serve as the guiding principle for Curry's life. After retiring in 1998 from a career in education working for Project SEED, a nonprofit that teaches advanced algebra and college level math to urban youth, Curry has dedicated much of her time to making a direct positive impact on her community. Thanks in large part to her fundraising, organizing and political savvy, Pennypack Farm grew into a working organic farm with a popular CSA. Now in its 12th year, the educational nonprofit employs four year-round farmers, two administrative staff, apprentices, interns and seasonal farmers. Curry has pursued her ideals on an academic level as well: she earned a master’s degree in Psychology and Environmental Studies at Vermont's Norwich University. There, she studied how one could be effective in shifting the cultural norms around issues of sustainability. Today, she's an associate of the Ambler Environmental Advisory Council, where she facilitates educational opportunities, such as workshops on composting and rain barrels, and running a light bulb and battery recycling campaign. As a member of the Pennsylvania Horticultural Society’s Tree Tenders, she led the effort to plant 85 trees in Ambler in 2007. Today, she's working with the Advisory Council to encourage Ambler residents to install rain gardens. While Curry has passed on some of her leadership responsibilities to the younger guard at Pennypack Farm, she is still involved with the farm’s Herbal Remedies Group, which meets monthly and also tends an herb garden at the farm, which Curry manages. She has been so involved that it was named The Susan Curry Garden of Medicinal Herbs in her honor.